A lot of recipes are hard to recreate in a keto version, but Low Carb Cornbread is by far the hardest! We made countless attempts before we got the perfect recipe down for you to make for the holidays this year. Corn bread is one of our favorites foods, and although I'll Boston Market makes it best and he'll say his grandma does, I think we can both agree on this being the best low carb, keto friendly cornbread we've made and tasted! Give it a try and see what your family and friends this this holiday season. I can't even recall how many times we attempted this cornbread recipe. There are so many recipes out there, on pinterest and food blogs, but honestly, none really live up to actual cornbread. We were determined however to get as close as humanely possible and we think we did just that! It's a shame that so many people put out recipes claiming to have created a low carb cornbread when in fact they have just created a low carb, flavorless bread. Matt hit a stroke of genius when he suggested baby corn and I used it to create this incredible, must have at Thanksgiving, recipe! What Makes For The Best Cornbread Recipe? To make the best cornbread not only does the consistency have to be on point, but additions are a must. In this recipe we made sure that it came out slightly crumbly and slightly sweet, but we jammed it full of cheddar cheese and chunks of baby corn for a savory bite! An entire can of baby corn has only 6 net carbs, perfect for this cornbread recipe! The best cornbread is also served alongside other amazing dishes, such as our low carb sweet potato casserole and green bean casserole! Make this year even more special and healthy for our family and friends. Once you get the cornbread ready to bake you can put it in any size you have on hand, however, if you are interested in the one we used - I am obsessed with it - you can find it HERE. It looks very elegant for serving and the red color will pop in the center of your dinner table. Whether or not you are celebrating the holidays this year, cornbread is a must have in all of our diets. So, make this low carb cornbread today and try not to eat the whole thing in one sitting! 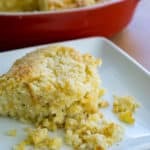 Recipe can be quickly added to MyFitnessPal - Search "KetoConnect - Low Carb Cornbread"
Preheat the oven to 350 and grease a 9 inch casserole dish. In a large bowl combine the eggs, melted butter, sour cream and liquid stevia. Whisk until full incorporated. Add the dry ingredients to the wet in two batches as you combine.